This Holiday Season, Support Your Small, Locally-Owned Businesses! I don't often re-post other people's work, but I believe that the message I've published below is worth repeating. I am not certain who the original author is, as I have seen this same message on a couple of other websites. And I would have probably written it a bit differently. However, the basic idea remains reasonable and sound. It doesn't matter if you are a Democrat or a Republican, whether you live in a big city or a small town, whether you have a lot of money or if you are struggling to make ends meet. 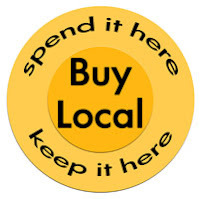 We all stand to benefit if you please support the small, locally-owned businesses in your community this holiday season. The gifts are likely to have more meaning to the recipients, and our society is certain to benefit from the economic stimulus. Musicians need love too, so find a venue showcasing local bands and purchase their CD's. Honestly people, do you REALLY need to buy another ten thousand Chinese lights for the house? When you buy a five dollar string of light, about fifty cents stays in the community. If you have those kinds of bucks to burn, leave the mailman, trash guy or babysitter a nice BIG tip. You see, Christmas is no longer about draining American pockets so that China can build another glittering city. Part of Christmas is now about encouraging American small businesses to keep plugging away to follow their dreams. And, when we care about other Americans, we care about our communities, and the benefits come back to us in ways we could not imagine. -- post it to discussion groups. This is a revolution of caring about each other, and our country. One of the perks of my job is rather frequent business travel. I call it a perk because a portion of the travel is regional and it allows me to drive my own car. Unlike some people, I enjoy driving about the countryside, and I have often said that my vehicle's windshield is the very best window in the office! I often listen to satellite radio while I drive. Sometimes it's news programming or talk radio, but I mostly listen to my favorite music from the 1970s and 80s. Hearing these songs again after thirty or more years can be an experience. Certainly I recall the popular melodies and the majority of the lyrics. However, now that I am older, I tend to pay more attention to the song's message. 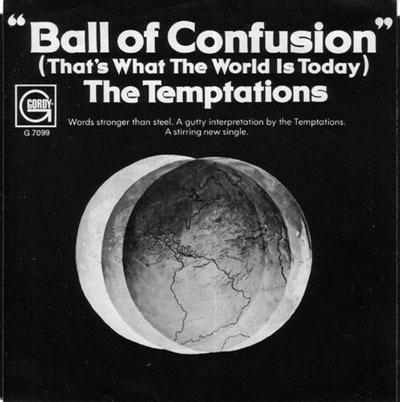 One song that has really (re)captured my attention is "Ball of Confusion," performed and recorded by the Temptations in 1970. I recall listening to this song when it first came out and considering the state of the world at that time, I believe that their song had great meaning. The beauty is, the song is still very much relevant today. For me, that staying power is the sign of a true work of art. It's quite possible that this song will remain quite relevant for years to come. Let's hope that humanity can prove me wrong. If you haven't heard the song lately, here are the lyrics. Read them carefully and enjoy.